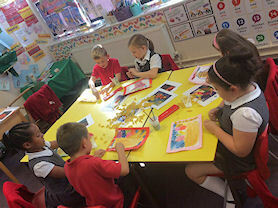 In St Margaret Mary's School, on 21st September children celebrated Art Day. 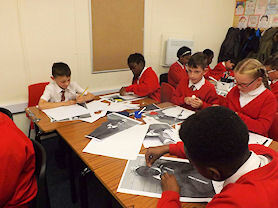 Creative lessons throughout the school were enjoyed by all the staff and children. 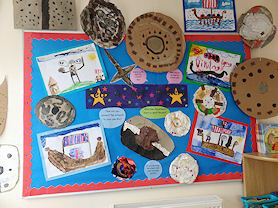 Various activities included painting, using water colours, sketching and even creating Viking shields. Various artists were studied and responses to artwork included throughout the day, covering a range of art skills. In Key Stage 1, children were focusing on copying the work of famous artists. In particular Year 2 looked at Turner and recreated his watercolour works of the Great Fire of London. In Key Stage 2, Children looked at art that had links within their topic. 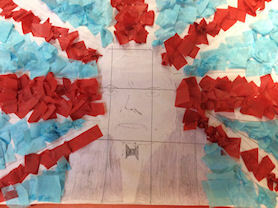 In Year 5 children created tributes to Winston Churchill, whilst in Year 6 children made themselves a monarch by creating their own royal portrait. Year 3 enjoying Art Day. Year 5 tributes to Churchill. Year 6 and their royal portraits.